On 16th January 2019, Year 4 set off on their first ever residential! 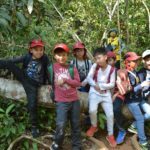 We stayed at an Outdoor Education Centre in Khao Yai for 2 nights. 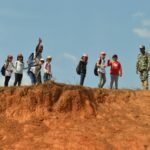 For a number of the children, this was the longest that they had been away from their parents so the first morning was filled with apprehension and excitement. As soon as we got the campus, we plunged straight into our first activity. We headed out to the field to test our balance and dexterity on the low-ropes course. We had to step and climb across a range of obstacles to complete the course. 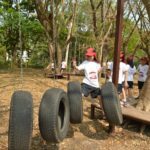 Some of the obstacles were particularly challenging; the swinging planks and tyres really tested our skills, but we did a fantastic job at overcoming our insecurities and all managed to complete the entire course. We then had lunch and returned to the field for team-building games. 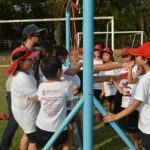 These included: having to get our team through a giant spider web, blindfolded directions and gathering games and a team ‘ski’ race. We finished off the day with a movie night and relaxing ready for our next full day of activities. On day 2, we packed our day bags for a day on foot and went down for breakfast. After we had eaten, we took the buses into Khao Yai National park, where we were greeted by dozens of macaques littering the road! This was a great sight and really got us excited for the other animals that we were hoping to see. 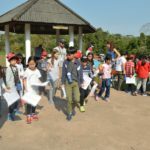 When we got to our site in the national park, we took part in a scavenger hunt and a game called ‘Loris ball’, which look at human impact upon our planet and the animals that live here. After lunch and reflection, we changed location and began our trek through the jungle! 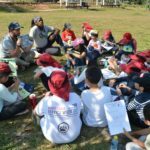 We were split into 3 smaller groups and each assigned a guide to help keep us safe and give us information about the environment we were in. It was hard work hiking across this fascinating terrain; we saw giant banyan and cinnamon trees, elephant salt-licks and got to survey our surroundings from an observation tower. 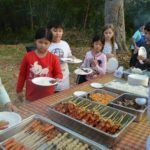 After our exhausting and exhilarating activities, we returned to campus for a BBQ and campfire. We roasted marshmallows and learnt some funny campfire songs before heading to our dormitories to pack our bags and get some sleep. Our final morning was a very memorable one. 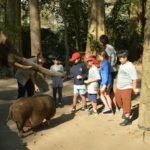 We travelled down the road to a small elephant conservation centre, where we were taught about the wild elephants of Thailand, got to see a real skeleton of an elephant and then meet 2 real elephants! It was breakfast time for the pachyderms and it was our job to fill their bellies. We shucked 4 big baskets of corn and fed them to the elephants by hand. We couldn’t believe how much they could eat and enjoyed watching a resident wild boar stealing what they dropped. We said goodbye to the elephants and went back to campus for a quick lunch before beginning our journey home to Bromsgrove with some fantastic memories and a greater awareness of conservation of our planet.